Review In A Nutshell: Beautiful and amazing, The Last Namsara was almost impossible to put down. Kristen Ciccarelli weaves a beautiful tale in this epic fantasy novel. Also, there are dragons. The Last Namsara follows Asha, the kingdom’s Iskari, a name taken from the goddess of death. She is the most feared dragon hunter, determined to make up for a deadly mistake she made as a child. When she’s given the chance to escape her engagement to the cruel commandant, in exchange for the head of the most powerful dragon, Asha doesn’t hesitate. The world she creates is realistic and gritty while keeping a mystical edge to it that had me wanting to learn more. And did I mention the dragons? I absolutely loved the dragons in this book. At some points, they reminded me of loyal dogs, while other times they were impressive enemies or intimidating allies. The relationship between the dragons and the main character, Asha, was very interesting to explore, as well as this history of the dragons and her people. Speaking of other things I was eager to learn about while reading; the mythology. The origins of the Namsara and the Iskari was very interesting to read about, and I especially loved how it reversed the stereotype of the female goddess being the happy, joyful, and loveable character, while the guy is brooding, sad, and lonely. That isn’t the only thing this book has a different take on. The Last Namsara frequently combines both old tropes (an arranged marriage to the Worst Person Ever™, forbidden romance, a romance between a slave and a royal, etc) with new ideas, making it completely its own. The characters, while some do lack a fully developed personality, are easy to relate to and feel for. I loved watching Asha develop, and watching the relationship between her and Tsumin grow. The side characters were equally interesting (which makes me so excited because we’ll be getting a companion novel). The plot maintains a good pace with a healthy balance between the action and the fascinating lore. The writing style was beautiful and elegant throughout the novel, making the interesting storyline have that much more of an impact. Cons– While the pace is good, and the world is well-built, it did take me a few chapters to really get into it. It’s best to read when you’re already in a high fantasy mood. 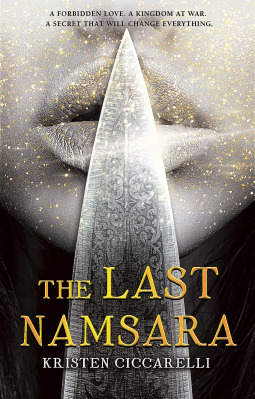 The Last Namsara is a great read for fans of Sarah J. Maas and Games of Thrones-ish worlds. Its full of magic, lore, and freaking DRAGONS! Did I mention the dragons enough?